It’s an all-too-familiar story for military families: Every few years, you pack up your family to head out on that next PCS adventure. Whether you’re moving to California’s sunny Hanford, Lemoore, Visalia or surrounding areas, the current housing market may have you thinking that buying a home in your new town is a wise move. There’s plenty of data to support the decision to buy. According to the latest data from Trulia®, a company that provides housing-market analyses, buying a home is 35% cheaper than renting in all of America’s 100 largest metro areas. For example, in Tucson, Ariz., home to Davis-Monthan Air Force Base, buying a house is 36% less expensive than renting. And Zillow®, an online real estate database, reports that in Tucson, it only takes 2.6 years for a homeowner to reach the break-even point — that is, the point at which it’s less expensive to own than to rent. Buying, selling, financing, insuring or renting your home? Home Circle™ puts all things home in one place to save you time and money. When you are buying and selling a house, you can receive a financial help through the latest programs. If you decide to rent, you need to make sure that your personal property is protected. Despite what real estate studies indicate, housing and personal finance professionals caution that renting is often better for the budgets of mobile military families. And Zillow doesn’t take into account the costs that military families incur when they have to move. They still have to pay the mortgage, taxes and insurance while their home is on the market. Another reason to think twice: the fluid housing market. According to Trulia, rising mortgage rates in 2013 have narrowed the gap between the cost of buying and the cost of renting. In fact, Trulia reports, the benefit of buying over renting shrank in nearly all of the 100 largest metro areas during the past year. The Honolulu area, home to Joint Base Pearl Harbor-Hickam, for example, is on the verge of what Trulia calls “tipping” — the point at which renting becomes cheaper than buying. The state of the housing market in which you’re thinking of buying. Despite changes in the market, buying still appears to be a good deal in many markets. Consider Detroit, where the break-even point in 2013 was less than 2 years, according to Zillow. In September 2013, Trulia reported that Detroit came in at 65% cheaper to buy than to rent — the biggest savings in the country. So it seems an airman stationed at Selfridge Air National Guard Base near Detroit would be a fool not to buy a house — right? Say you received PCS orders. Even if your home were to sell quickly, consider the other costs: Real estate commissions and other fees can cost you north of 6% of the sale price. That’s more than $10,000 on a $170,000 home. “You’ve got to be able to overcome those costs for buying to make sense,” Montanaro points out. Many military families have access to VA loans, which often don’t require a down payment. This offers both opportunity and danger. If you buy a home with little or nothing down and prices drop, you could find yourself underwater — meaning you owe more on the house than it’s worth — and have to bring a check to closing when you sell. Think of it as a delayed down payment. If you’re not prepared for these types of costly and stressful events, home ownership — which should a rewarding experience — may not be for you. 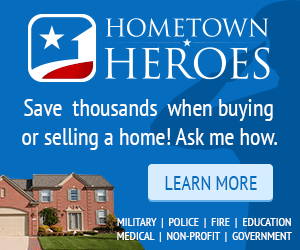 We love to pay it back by helping the military get deals on real estate. Reach out, you won’t be disappointed.